"A garden which contains shelters is ideal, because the children can play or sleep under them, and can also bring their tables out to work or dine. In this way they may live almost entirely into the open air..." ~Maria Montessori, Dr. Montessori's Own Handbook. I have a black thumb. I'm not proud of it. It just is what it is. I come from a long line of wonderful gardeners. I have surrounded myself with family and friends who have lavish potted plants, raised flower beds, and beautiful tomatoes every year. And I kill water plants from over watering! Every year I tell myself that this year will be different This year I will be able to grow wonderful home-grown food, gorgeous flowers, and help my budget a little because of all my efforts. I started our garden a little different this year. 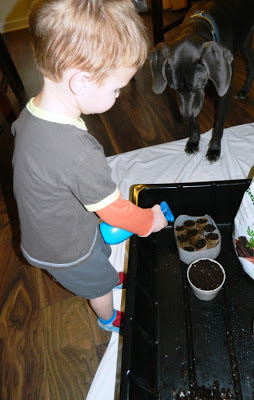 This year my kids helped me start the seeds for our garden. I hope this process will help them grow to love gardening and for it to be a part of life and not a forced habit. I'm confident in our abilities to have at least one tomato to add to our salad and some basil to throw onto a homemade pizza! Wish us luck! My first stop when I need advice (after talking with my husband) is to talk with my Mom. I have been blessed with two amazing Mom's (my mom and my mother-in-law) that are always supportive and helpful with all my random questions on how to best get my kids from point A to point B (the end of their lives). My Mom reminded me the other day that February is the time to start seedlings to have to move to the garden. She lives in NC so I searched for a site that gave the best plant seeds to plant in GA. I came across an amazingly informational and helpful site called One Hundred Dollars A Month and their posted Regional Planting Guide. You can go to this same site to view a chart that lists all the fruits and vegetables by month for your area that should be planted in the ground or started by seed indoors. 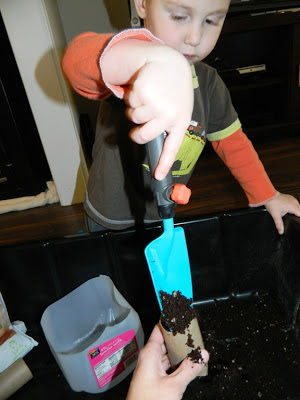 We chose 5 items we thought we would like to have in our garden and started with those (keeping in mind my black thumb!). We gathered up some materials. 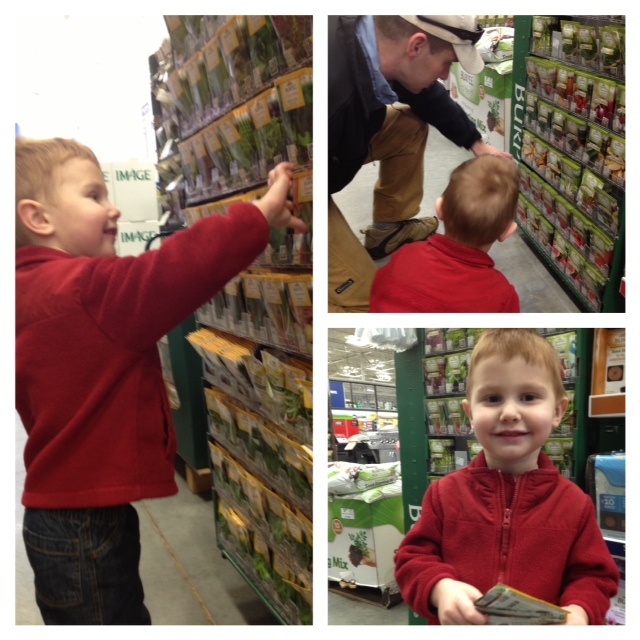 First, a shopping trip to pick out our seeds. Samuel and Dad collected our seed packages and picked up a bag of soil from the store. 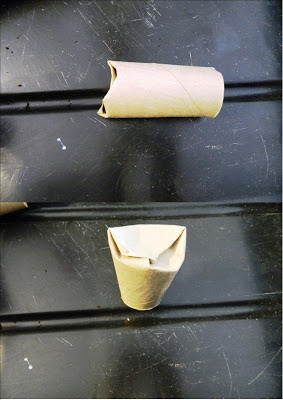 My Mom suggested starting our seeds in toilet paper rolls. 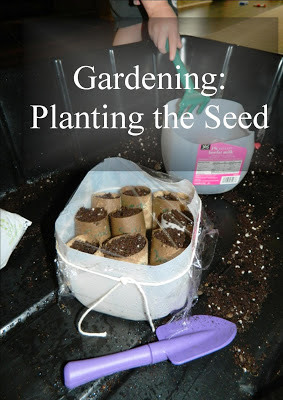 The cardboard will easily peel away when it is time to move the seedlings into pots or ground. We found some new child size shovels from Big Lots for $3 total and had a spray bottle from Target for $1. I saved a couple of our old milk jugs and cut them in half for containers to hold our seedling tubes and to use as buckets. Also not pictured is some clear plastic wrap and kitchen twine to make the greenhouse. We have had the black tub for a while. We found it at Lowe's in the concrete section for $13. It has been useful in so many wonderful ways! I started by folding over one end of our toilet paper rolls. Nothing fancy, just a way to keep the dirt from falling out of the bottom. Then we added some dirt into our rolls. 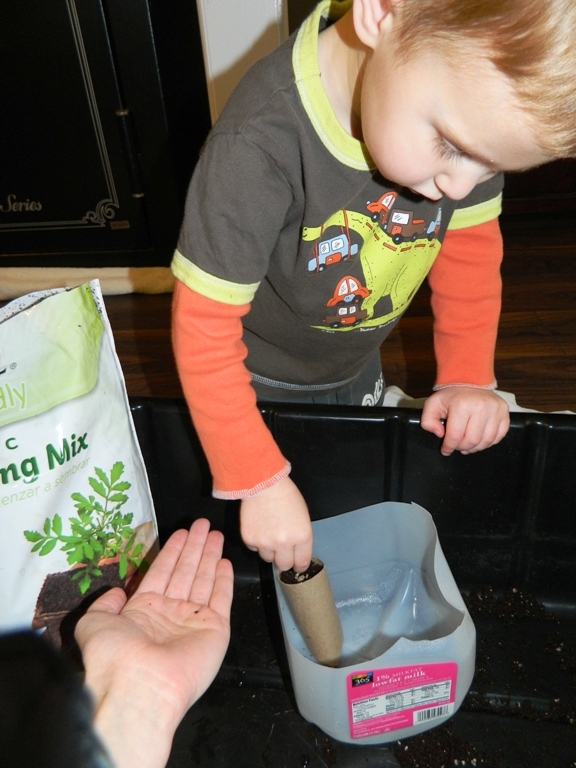 This is a great pouring activity. Samuel liked to try pouring with both hands. Then, we added some seeds to our roll. 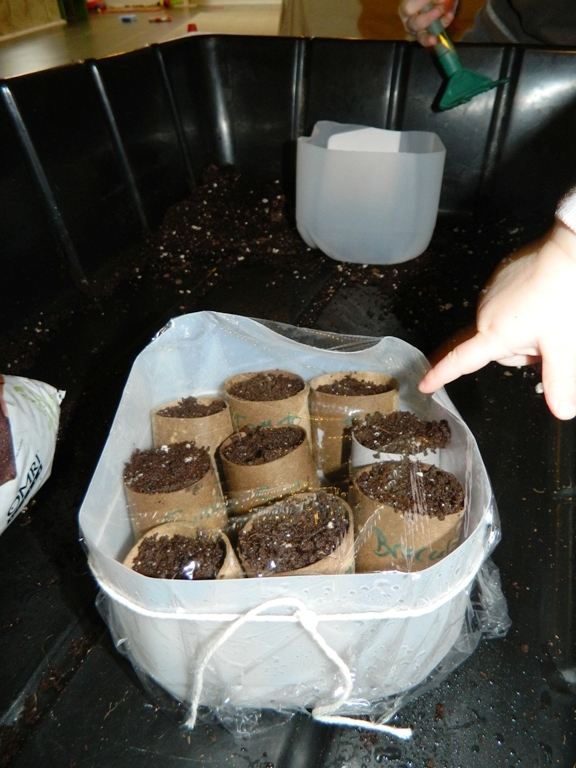 We covered our seeds with more dirt. I then wrote the names of what we planted on the side of the rolls with permanent marker. 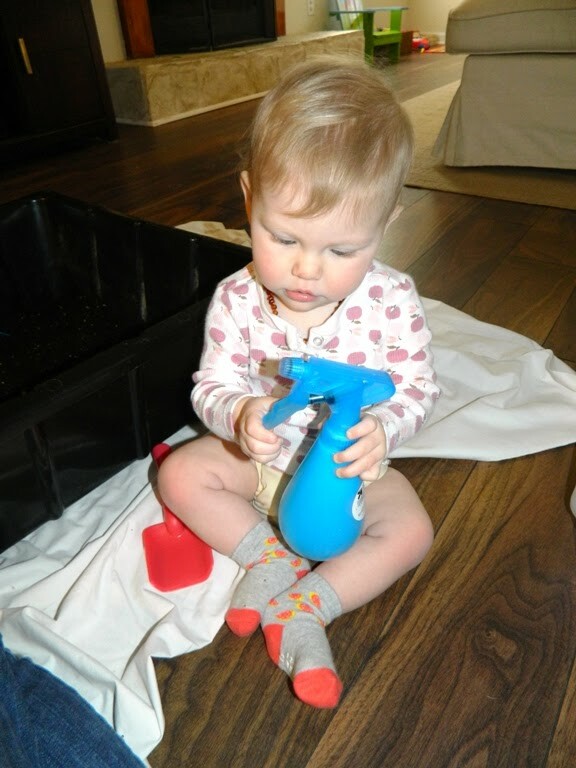 Avalyn was glad to explore all the new items used for gardening. She happily watched and crawled around, but wasn't as interested in getting into the dirt. 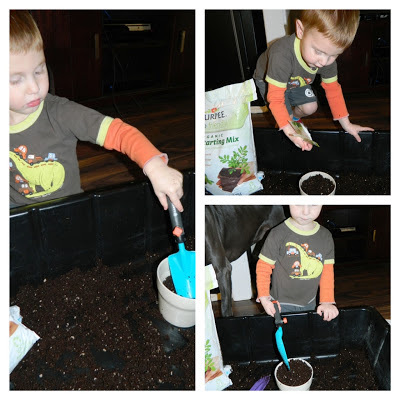 We also filled a pot to plant our basil. These pots I found at IKEA for $.99. They have seen many dead plants so far so here's hoping this basil is different since Samuel planted it! After we planted all the seeds in our rolls and pot, we watered with a spray bottle to avoid drenching and ultimately killing our un-sprouted plants. My Mom suggested covering our planted rolls with clear plastic wrap to create a greenhouse. I'm up for any suggestions to help this process work! There are so many wonderful FREE printable materials out there. 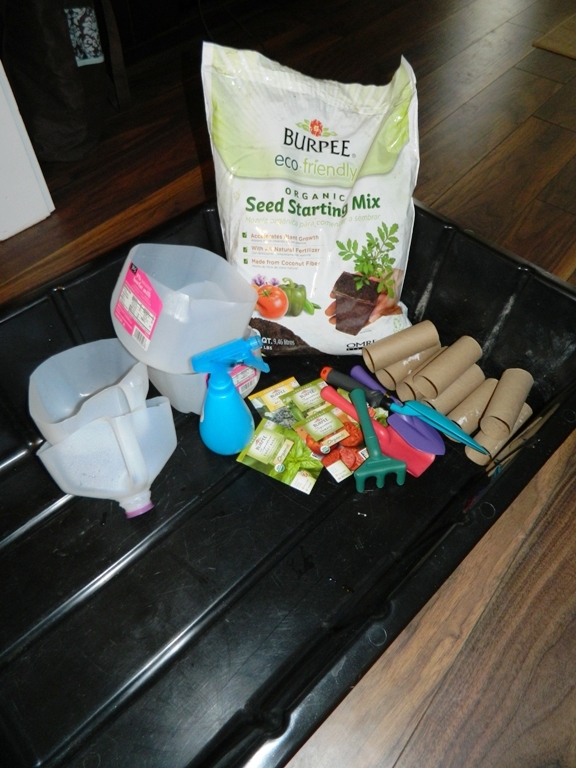 Deb at Living Montessori Now has a page of Free Montessori Botany Materials for a Gardening Unit H E R E. Their Montessori Gardening Unit is H E R E. I will integrate some of these free materials throughout the gardening season this year. 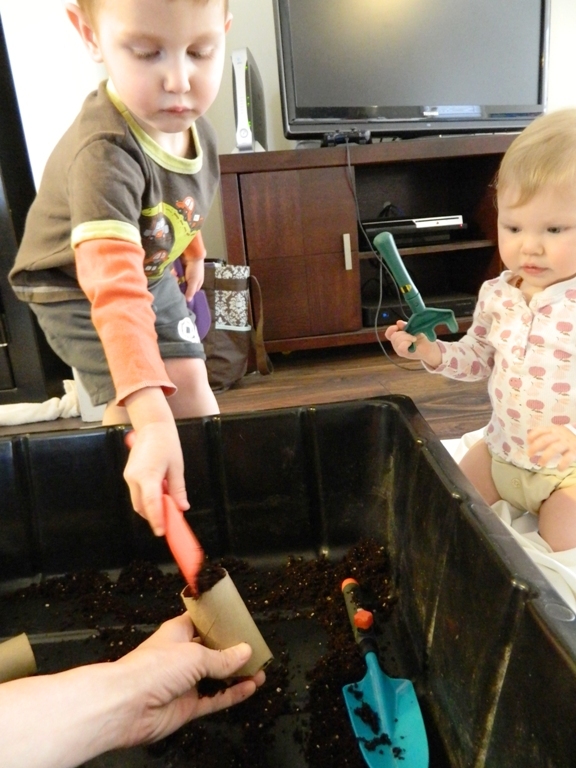 At Discovery Kid Zone Montessori Adventures is a great gardening post with step by step instructions to help your children work through some gardening activities. 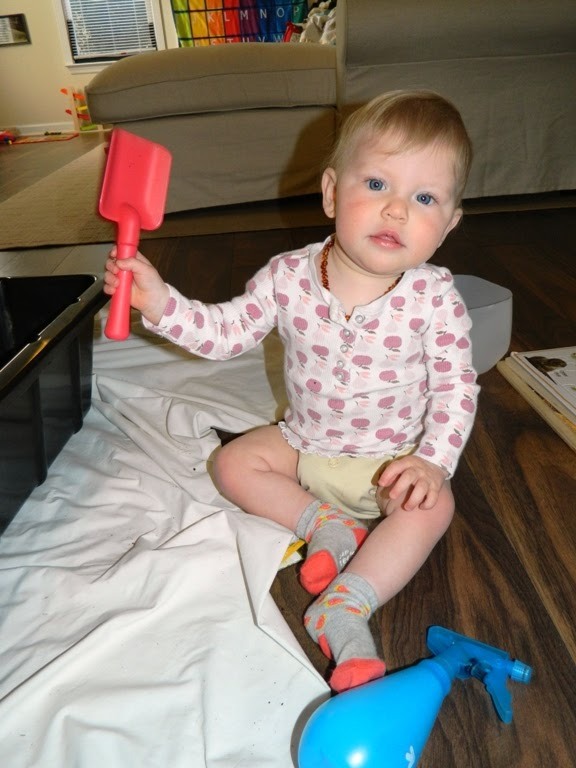 She suggests some great books to read with your children too. 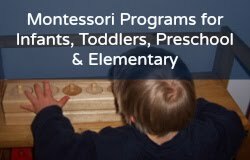 Montessori for Everyone has a long list of free materials on their cultural materials page. 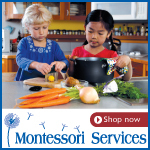 They also provide materials for seasons and zoology among other topics. We can't wait to get back outside more with the warmer weather. We will speak loving words to our seedlings as they grow in hopes they will produce my one tomato if not bushels more!